A tied arch bridge carries pedestrians across Interstate 235. This is one of three built during the multi-year Rebuilding I-235 project to provide freeway beautification and neighborhood connectivity. Photo taken 09/04/05. Interstate 235 forms an urban loop from West Des Moines east to Downtown Des Moines, then north to unincorporated Polk County and Ankeny. Interstates 35 and 80 bypass the capital city to the north, but along a suburban route through Clive, Urbandale and by the cities of Grimes and Johnston. Heading east from the merge of Interstates 35 and 80 (West Mixmaster Interchange) through West Des Moines, I-235 travels below grade with six overall lanes and auxiliary lanes to 22nd Street. Crossing Walnut Creek, the freeway straddles the south city limits of Windsor Heights to Iowa 28 and Des Moines. Sound walls line portions of the route east as I-235 expands to eight lanes. Staying below grade, Interstate 235 increases to ten lanes in width with auxiliary lanes as it crosses northern reaches of Downtown Des Moines by Mercy Medical Center. While approaching the Des Moines River, the freeway reduces to six lanes as it begins the northern turn toward Ankeny. The state capitol appears just south of I-235 by Exit 9 with U.S. 65. Sound walls again line the freeway right of way northward from Iowa 163 to the return of Interstates 35 and 80. Within the East Mixmaster Interchange, the freeway mainline defaults motorists onto I-35 north toward Ames, Mason City and Minneapolis while the original roadway serves movements back west to Johnston and east along I-80 to the Quad Cities. Interstate 235 was completed from Cottage Grove Avenue east to Pennsylvania Avenue by November 1963. Extensions were made in 1966 west to 31st Street and east to Easton Boulevard. Note that Interstates 35 & 80 were shown overlapping south from the West Mixmaster Interchange. 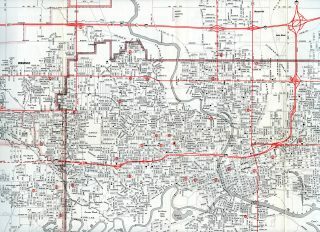 Early 1960s maps showed I-80 proposed parallel to what was U.S. 6 west from Grand Avenue. 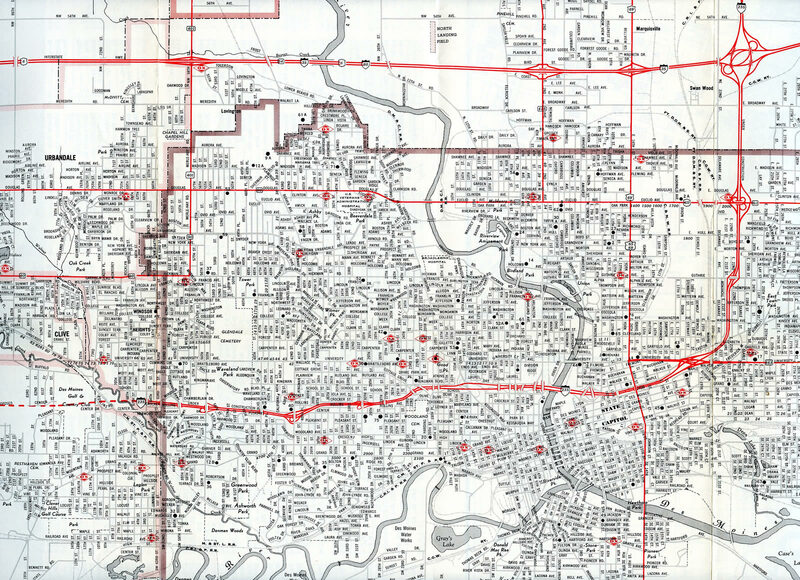 1966 Des Moines fold map showing the bulk of I-235 completed within the capital city. The original design of Interstate 235 included roadway splits at Keosauqua (Keo) Way west of the Des Moines River and at University Avenue. The separations accommodated left-hand entrance ramps. The first portion of I-235 opened was the 1.2-mile section from Cottage Grove Avenue to 12th Street, including the bridges across the Des Moines River. This stretch took three years to build and cost $9.5 million. Further north, the exchange between I-35, I-80 and I-235 was nicknamed the [East] "Mixmaster" by highway engineers in 1961, due to the intricate nature of its design.3 The junction between I-35, I-80 and I-235 in West Des Moines was nicknamed the West Mixmaster Interchange. 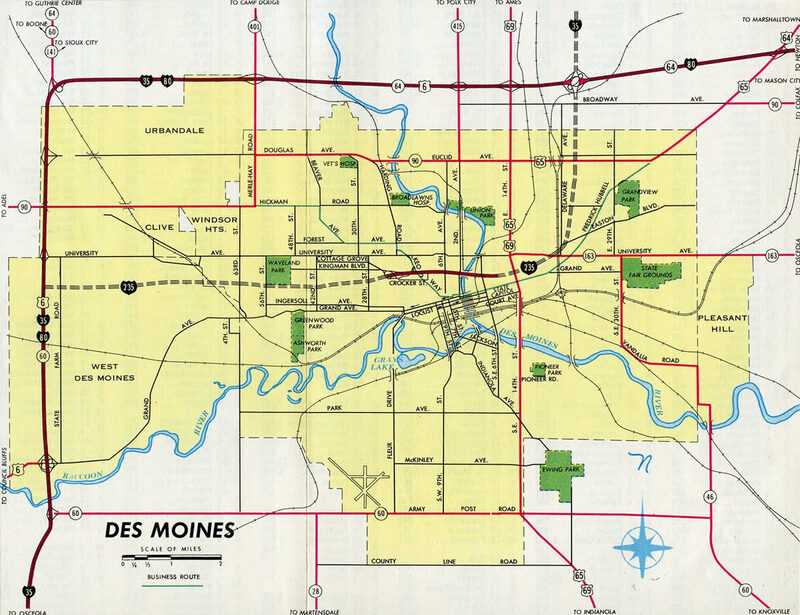 The MacVicar Freeway graced the cover of the 1967 Iowa Official Highway Map. This scene looked east from the 3rd Street overpass toward the Des Moines River and State Capitol. The curved entrance ramp from 2nd Avenue north to I-235 west was rebuilt in 2003. All of Interstate 235 was reconstructed to modern design standards during the $429 million Rebuilding I-235 project underway from March 2002 to 2007. Construction replaced all low clearance bridges, expanded the freeway to at least six lanes in width, lengthened exit and entrance ramps and added lighting and landscaping. Three steel pedestrian bridges were added at 44th, 40th and East 6th Streets. The basket-handle arch bridges replaced preexisting structures. The span design celebrates the arched river bridges that are symbolized in the city logo. The Edna M. Griffin Memorial Bridge near East 6th Street was completed in January 2004. The 40th and 44th Street bridges were constructed from October 2004 to fall 2005. A new eastbound entrance ramp was added from Valley View Drive north. Ramps along I-235 were were realigned further south and the Valley View Drive overpass was replaced. The 56th Street overpass was replaced and the loop ramp from southbound to I-235 east was removed. The interchange was reconstructed with a new bridge built over I-235. A diamond interchange replaced the eastbound off-ramp to 35th Street and a loop ramp from 31st Street south to I-235 east. Bridges for I-235 over 35th and 28th Street were replaced, as was the 31st Street overpass. Cottage Grove Avenue was realigned onto a new overpass in conjunction with a new eastbound off-ramp to School Street in 2002. New ramps were added from both the new 19th Street bridge and MLK, Jr. Parkway to southbound. The split directions of Cottage Grove Avenue and its associated ramp system to I-235 were demolished. Keo Way was reconstructed below I-235 while new off-ramps were completed. The service roads connecting Interstate 235 with Keo Way and 19th Street take the place of the former freeway mainline, which previously separated to accommodate left-hand ramps along eastbound to and from Keo Way. A new on-ramp to I-235 was also completed, which passes below the new off-ramp to 7th and 3rd Streets. The loop ramp on the southeast quadrant with Keo Way was removed as well. Overpasses for 2nd Avenue, 3rd Street and 5th Avenue were replaced and ramps reconstructed. The 12th Street on-ramps, which joined the left-hand side of both directions of Interstate 235, were permanently removed. New bridges for all three numbered streets. The curved overpass for 5th Avenue was removed and 5th Avenue was made continuous north of Day Street. New bridges were built for East 6th and 9th Streets in 2002. Redesign of the interchange consolidated back to back off-ramps into a wider split-diamond interchange. Collector distributor roadways added between 12th and 14th Streets as part of interchange reconstruction. A new westbound roadway was constructed for I-235, replacing the westbound ramps to and from Easton Boulevard. The split roadways of Interstate 235 were realigned to eliminate left-hand on-ramps from Iowa 163. Ramps along I-235 east to Easton Boulevard were rebuilt, while the separate sections of Easton Boulevard below the freeway were linked. The U.S. 6 overpass was replaced and the loop ramp from I-235 north to Euclid Avenue was removed. Construction following the Rebuild I-235 project in 2007-09 addressed some of the left-hand movements at the East Mixmaster interchange. A new set of roadways was built to seamlessly link Interstate 235 to the south with I-35 to the north. The former north and southbound lanes were repurposed as distributor roadways for the exits from I-35 south and I-235 north. Left-hand ramps remain in place from I-80 west to I-235 south and at the northbound split of I-35 from I-80 east. Nearing the six-ramp parclo interchange (Exit 12) with U.S. 6 (East Euclid Avenue), drivers along I-235 east see the first sign for the pending East Mixmaster Interchange. Photo taken 06/19/15. A two lane ramp departs in 1.25 miles for both Interstate 80 east to Davenport and I-35 south & 80 west to Johnston, Urbandale and Grimes. The forthcoming ramp was the I-235 mainline prior to the 2008 rebuild of the East Mixmaster Interchange. Photo taken 06/19/15. Interstate 235 leads due north with six overall lanes to Exits 137A/B with Interstates 35 and 80. Photo taken 06/19/15. An end sign appears for Interstate 235 as Exits 137A/B depart in unison for I-80 east to Davenport and I-35/80 west toward Council Bluffs and Kansas City. Photo taken 06/19/15. Interstate 80 straddles northeastern reaches of Des Moines to the outer loop freeway (U.S. 65) at Altoona. A mostly rural drive takes the freeway 101 miles east to Interstate 380 & U.S. 218 (Avenue of the Saints) at Iowa City. Photo taken 06/19/15. Interstate 235 east at U.S. 6 (East Euclid Avenue) during the Rebuild I-235 construction. A blank sign remained from the closed loop ramp for U.S. 6 west. A new sign bridge added further south revised the distance for Interstates 35 and 80 to 1.25 miles. Photo taken 09/04/05. Two lanes of I-235 east crosses over NE 46th Avenue ahead of the former roadway split through the East Mixmaster Interchange. Photo taken 09/04/05. Prior to 2007, the northbound lanes of Interstate 235 bowed outward to accommodate left-hand ramps from Interstate 35 north and I-80. These lanes remain today for exits to Davenport and Council Bluffs but do not return to the new I-235 mainline running through the middle of the interchange. Photo taken 09/04/05. Northbound Interstate 235 reached the connecting ramp to westbound Interstate 80 and southbound Interstate 35. The mainline continued north to merge with northbound Interstate 35. Photo taken 09/04/05. Interstate 80 traverses a rural area from the north end of the Des Moines outer loop (U.S. 65) to the East Mixmaster Interchange (Exits 137B/A) with Interstates 35 north and 235 west. Photo taken 04/12/13. A left exit takes motorists onto Interstate 235 (MacVicar Freeway) south to Downtown Des Moines and west to Windsor Heights and West Des Moines in just over a half mile. Photo taken 04/12/13. Exit 137B departs next for Interstate 35 north through the suburb of Ankeny to Ames, Mason City and Albert Lea, Minnesota (crossroads with Interstate 90). Photo taken 04/12/13. Exit 137A formerly connected with the left-hand side of Interstate 235 leading south from I-35. Visible here, a new set of roadways were constructed through the East Mixmaster Interchange in 2008. Photo taken 04/12/13. The two-mile guide sign for the East Mixmaster Interchange was located at Exit 141 with U.S. 65 south. U.S. 65 south and Iowa 5 from Carlisle west represent a belt freeway that encircles the outer suburbs of Des Moines to the south and west. Photo taken by Steve Hanudel (05/15/06). This set of signs posted after Fourmile Creek was carbon copied by 2011 to include a Left Exit tab for I-235 west. Photo taken 09/04/05. Replaced guide signs posted at the ramp departure (Exit 137B) for Interstate 35 north. I-35 reaches Ames in 25 miles. Photo taken by Steve Hanudel (05/15/06). Original button copy signs posted at the East Mixmaster Interchange. This stretch of Interstate 80 opened to traffic on October 8, 1962. Photo taken by Michael Summa (1976). Exit 137A departed here and joined the left side of Interstate 235 west into Des Moines. A pair of overpasses were constructed above I-80 here in 2008 to better link Interstates 35 and 235. Photo taken by Steve Hanudel (05/15/06). Eastbound at the diamond interchange (Exit 135) with Iowa 415 along Interstates 35 east & 80 north, 2.25 miles ahead of their split. The left-hand panel was removed by 2009. Photo taken by Jason Hancock (05/06/06). This set of signs for Exits 137A/B were combined into a single Clearview font based sign by 2009. Departing here is Exit 136 for U.S. 69 south along East 14th Street into Des Moines and north through the industrial park area at Marquisville. Photo taken by Jason Hancock (05/06/06). Passing over a pair of Union Pacific Railroad lines, motorists saw these two signs for the upcoming East Mixmaster Interchange. A single lane ramp takes the I-35 northbound mainline toward Ames and Mason City while a right-hand ramp departs for Interstate 235 west back into Des Moines. Photo taken by Jason Hancock (05/06/06). Interstate 80 continues east with two through lanes as back to back ramps depart for I-235 west to Downtown Des Moines and I-35 north through Ankeny. Photo taken by Jason Hancock (05/06/06). The westbound overpass for Interstate 235 was demolished in 2008 and replaced with a new bridge. The left-hand ramp for Exit 137B remains in place as the mainline movement of Interstate 35 north. Photo taken 09/04/05. Heading south through Ankeny, Interstate 35 sees a diamond interchange with Corporate Woods Drive (Exit 89) on the 2.5 mile approach to the East Mixmaster Interchange with Interstates 80 and 235. Photo taken 10/05/08. Interstate 35 overlaps with Interstate 80 west for 15 miles through the suburbs of Johnston, Grimes, Urbandale and Clive while I-235 loops south and west through central Des Moines. Photo taken 10/05/08. Two lanes continue south from Interstate 35 onto the beginning of I-235 as all exiting traffic parts ways for Interstate 80. Photo taken 10/05/08. Exit 137A separates from Interstate 35 south for I-80 east to the suburbs of Altoona and Bondurant and the Quad Cities. Photo taken 10/05/08. This diagrammatic sign was installed by 2007 to reflect the new freeway mainline leading motorists south from Interstate 35 onto I-235 (MacVicar Freeway). It was replaced by three separate Clearview font based panels by 2011. Photo taken 10/05/08. This set of signs preceded the roadway separation of Interstate 35 south through the East Mixmaster Interchange. The original westbound lanes now serve traffic to I-80 east and the I-35 mainline merge with I-80 west. Photo taken 09/04/05. A lane drop occurred on Interstate 35 south at the TOTSO (turn off to stay on) movement onto Interstate 80 west at the westbound beginning of Interstate 235. Photo taken 09/04/05. The original split of Interstate 235 west from I-35 south. The roadway leading to the loop ramp for I-80 west was reconstructed into a single lane ramp in 2008-09. Photo taken 09/04/05. The westbound roadway of Interstate 235 split with Exit 87A for Davenport while veering east. A new roadway built to accommodate six lanes replaced this movement in 2008-09. Photo taken 09/04/05. Interstate 235 leads 1.25 miles west from Valley West Drive to the directional cloverleaf interchange with Interstates 35 and 80. The forthcoming exchange utilizes exit numbers from the mileage of I-80. Photo taken 04/12/13. Continuing west through an area of business parks, retail and apartment complexes, Interstate 235 passes under 42nd Street through West Des Moines. A lane drop occurs in 0.4 miles for Interstates 35 north & 80 east to the northwest suburbs of Urbandale and Grimes. Photo taken 04/12/13. A second set of signs for Exits 123A/B and the West Mixmaster Interchange were added at the half diamond interchange (Exit 1A) for 50th Street by 2015. Photo taken 04/12/13. Through traffic for Interstate 80 west to Omaha and Cheyenne should use the left two lanes as Exit 123B departs for I-35 north to Ames and Minneapolis and I-80 east to Iowa City and the Quad Cities. Photo taken 04/12/13. The I-80 control city of Council Bluffs is 115 miles to the west while the much larger city of Omaha is just across the Nebraska line at 123 miles. Kansas City is a 176 mile drive to the south via Interstate 35. Photo taken 04/12/13. The loop ramp for Interstate 35 south was previously unnumbered. A slight change was also made for the I-235 end sign by 2005. Photos taken 09/04/05 and by Dale Sanderson (2002). Interstate 80 curves east through a six-ramp parclo interchange (Exit 121) with Jordan Creek Parkway on the one mile approach to the West Mixmaster Interchange (Exit 123) with Interstates 35 and 235 east. This diagrammatic sign was replaced with a sign using Clearview font by 2015. West Des Moines was dropped as a control city. Photo taken by Jeff Morrison (08/19/04). The mainline continuation of the I-80 freeway at the East Mixmaster Interchange is assigned Exit 123A as Interstate 80 turns north via a two-lane directional ramp to combine with Interstate 35. This diagrammatic sign was replaced by 2015 to include a Left Exit tab for 123A. Note that Chicago is used as a control city for I-80 east, while Davenport is used at the East Mixmaster Interchange. Photo taken by Jeff Morrison (08/19/04). Original button copy overheads posted at the 60th Street overpass for the West Mixmaster Interchange. I-235 extends the freeway east through West Des Moines another four miles. Photo taken by Michael Summa (1979). Motorists bound for Interstate 35 south to Kansas City depart in unison with the Interstate 80 northward turn to Clive, Urbandale and Johnston. This set of signs was replaced by 2015 with West Des Moines omitted. The capital city suburb was dropped from signs along I-80, as the municipal limits annexed areas westward to Ashworth Road. Photo taken by Jason Hancock (03/99). Button copy signs posted at Exits 123A/B referenced Interstate 235 east on a pull through panel. Photo taken by Michael Summa (1979). New signs awaited installation along Interstate 35 near the end of an expansion project that widened the freeway from four to eight lanes. The West Mixmaster Interchange (Exits 72A/B) with Interstate 80 west to Omaha and Interstate 235 (MacVicar Freeway) east to Des Moines lies one mile ahead. Photo taken 06/19/15. A lane drop occurs along I-35 north at Exit 72A for Interstate 235 leading east through West Des Moines. Photo taken 06/19/15. Ashworth Road spans Interstate 35 north at the ramp departure of Exit 72A. Interstate 235 extends east from the I-80 mainline, eight miles to the Des Moines central business district. Photo taken 06/19/15. Departing beyond the ramp for Interstate 235 is the loop ramp (Exit 72) for westbound Interstate 80 en route to Council Bluffs, Omaha, Lincoln, Cheyenne, and Denver (via the western Interstate 76). Photo taken 06/19/15. The first guide sign for the West Mixmaster Interchange was previously posted at the Mills Civic Parkway single point urban interchange (SPUI). Construction to expand I-35 to six overall lanes in 2011-13 removed this sign bridge. Photo taken 09/04/05. Just north of Jordan Creek on the one mile approach to Exits 72A/B for Interstates 80 west and 235 east. This set of overheads was carbon copied in 2013 with Clearview font. Photo taken 09/04/05. These new signs added at the one mile mark ahead of the West Mixmaster Interchange were taken down to make way for freeway expansion by 2015. Photo taken 04/12/13. Former guide sign posted at the Ashworth Road overpass. Most replacement signs omit West Des Moines as a control city. Even though Interstate 235 is primarily east-west, it is signed as a branch route of I-35 instead of Interstate 80. This is possibly because with the exception of I-880, all of the other loop designations are already used in the state. Photo taken 09/04/05. The I-35 mainline progressed north from the off-ramp (Exit 72A) for I-235 east to merge with Interstate 80 east through Clive and Urbandale. Photo taken 09/04/05. A loop ramp from University Avenue adds a fourth southbound lane to the western turn of Interstate 80 away from I-35 south. Exit 72A follows in 0.75 miles for I-235 leading east through West Des Moines to Downtown Des Moines. Photo taken by Steve Hanudel (05/15/06). Exit 72A loops away from Interstate 35 south to I-235 east back toward Des Moines. Drivers continuing south remain within West Des Moines to the Madison County line. Suburban areas spread south along the freeway to the Raccoon River. Photo taken 04/12/13. Passing over U.S. 6 on I-35 south & 80 west 1.25 miles ahead of the West Mixmaster Interchange with Interstate 235 east. This sign bridge was removed after 2008 and replaced with a variant of these signs further south at the crossing of Walnut Creek. Photo taken 09/04/05. Button copy signs were still in use along Interstate 35 south at the split with I-80 west. These were replaced with Clearview font based panels by 2008. Expansion of I-35 through the West Mixmaster Interchange in 2011 led to the removal of this sign bridge. Photo taken 09/04/05. Now separated from Interstate 80, southbound Interstate 35 reaches the exit ramp for Exit 72A, Interstate 235 east to Des Moines. These were older, button copy signs. Photo taken 09/04/05. "Problems noted in beltway plan." Des Moines Register, November 21, 2012. "Iowa&apos;s Newest Interstate?" Iowa Public Radio, October 3, 2014. 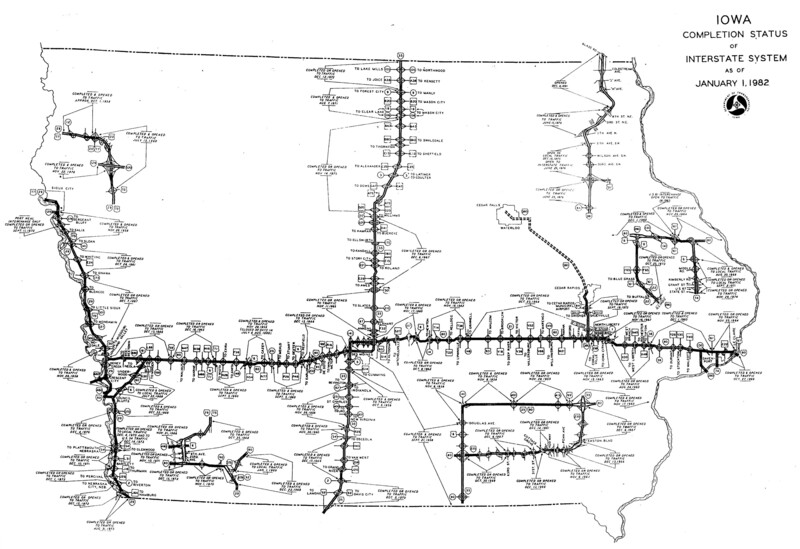 "Iowa Completion Status of Interstate System as of January 1, 1982." Iowa Department of Transportation.